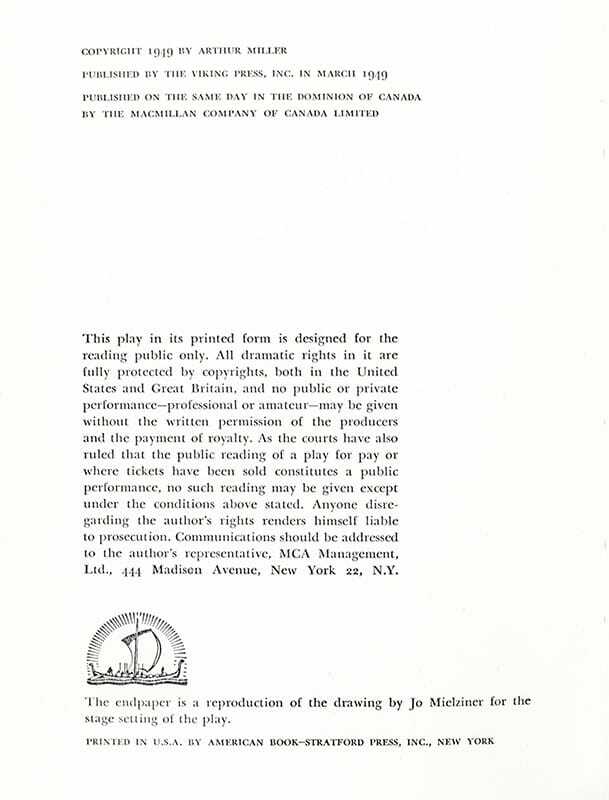 Rare pre-publication of the first edition of the first play to win all three major drama awards upon its opening in 1949: the New York Drama Critics Circle Award, the Tony Award, and the Pulitzer Prize. Octavo, original wrappers, with the original slipcase, uncased publisher’s copy with sewn signatures, pictorial endpapers. Signed by Arthur Miller in a contemporary signature. Housed in publisher’s cloth slipcase. We have been unable to find a comparable example, most likely one a few copies published before the last transit stage from manuscript to book. In near fine condition. A rare example of one of the highspots of twentieth century literature. 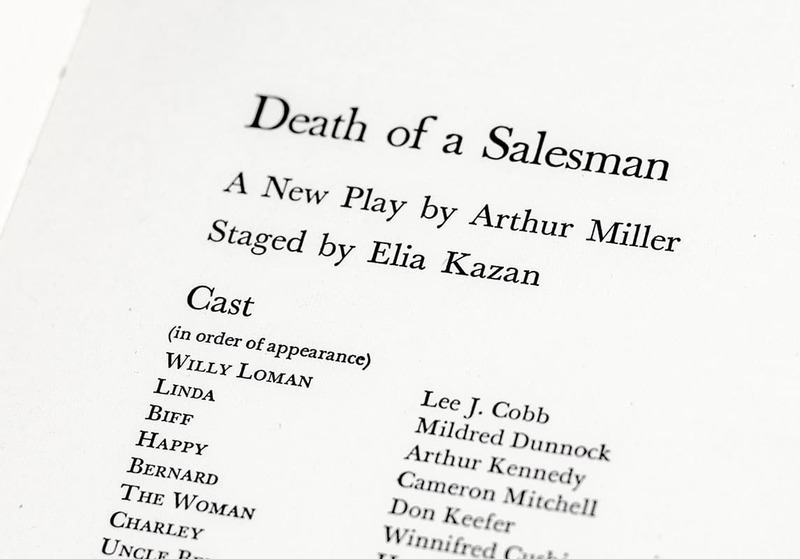 When Death Of A Salesman premiered in 1949, it was an instant success and secured Arthur Miller's place as one of the great American playwrights of the 20th century. It was the recipient of the 1949 Pulitzer Prize for Drama and Tony Award for Best Play. The play premiered on Broadway in February 1949, running for 742 performances, and has been revived on Broadway four times, winning three Tony Awards for Best Revival. The Creation of the World and Other Business. New York: Viking Press, 1973. First edition. Octavo, original cloth. Fine in a fine dust jacket. 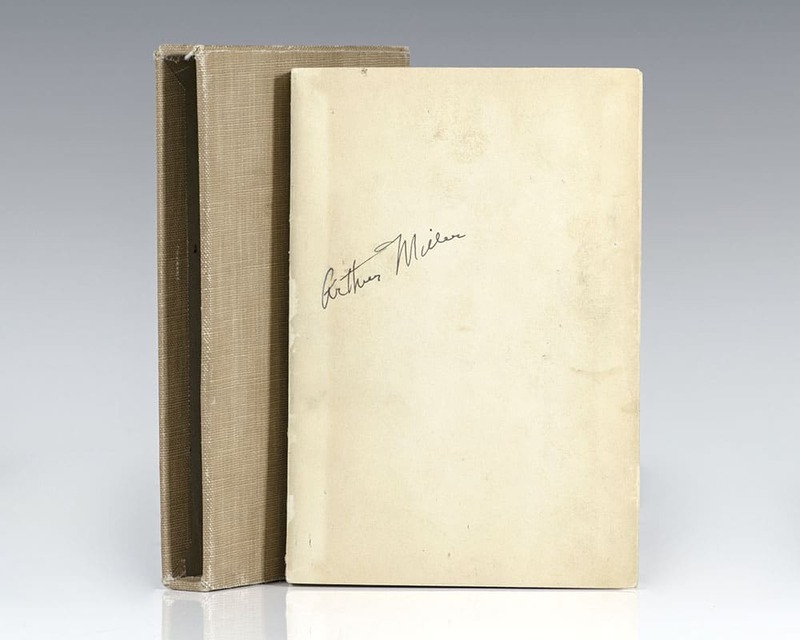 Signed by Arthur Miller on the title page. 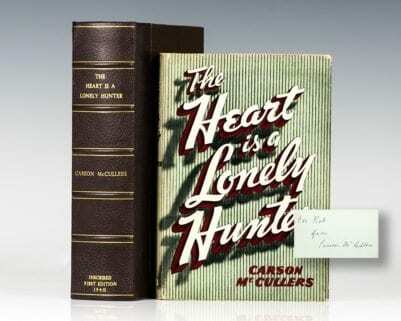 First edition of this central work in the canon of American drama. Octavo, original half cloth. 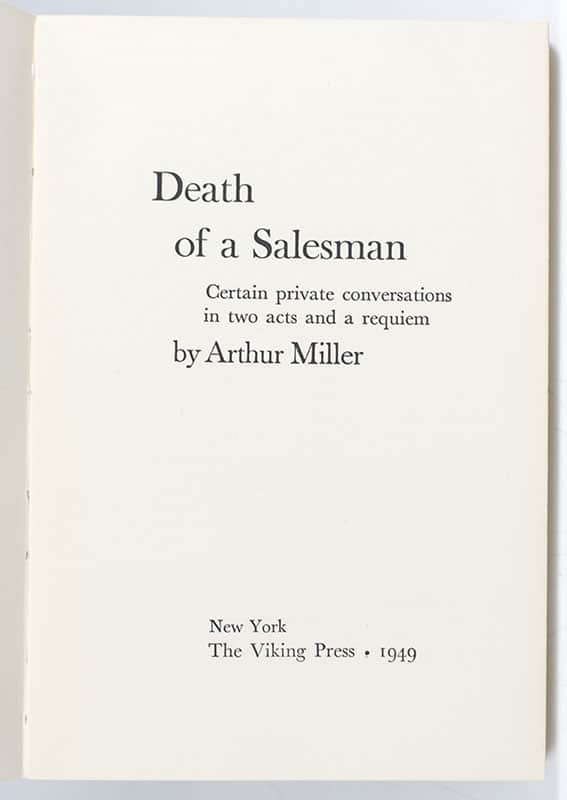 Signed by Arthur Miller on the title page. Fine in a near fine price-clipped dust jacket without the ubiquitous spine fade usually associated with this title; some light professional restoration to the extremities. Jacket photograph by Gjon Mili. Housed in a custom half morocco clamshell box. 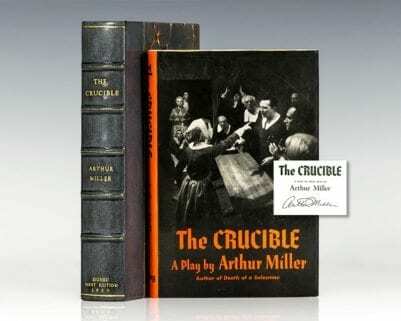 First edition of the first play to win all three major drama awards upon its opening in 1949: the New York Drama Critics Circle Award, the Tony Award, and the Pulitzer Prize. Octavo, original orange cloth, pictorial endpapers. 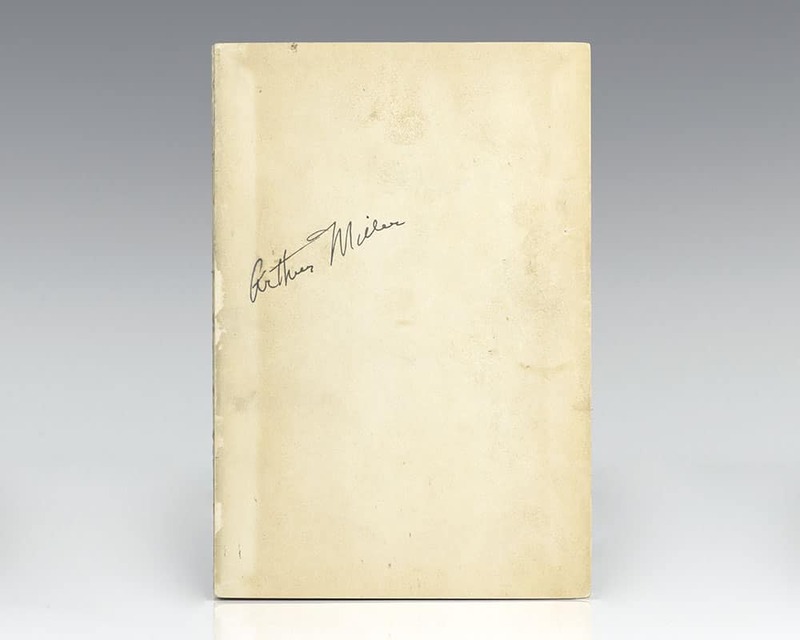 Boldly signed by Arthur Miller on the title page. Very good in a very good first issue price-clipped dust jacket with some rubbing and wear. Jacket drawing by Joseph Hirsch. Housed in a custom half morocco clamshell box. New York: Viking Press, 1984. First edition. Octavo, original half cloth. Inscribed by the author. Near fine in a near fine dust jacket with light wear.